Jannie Bekker, a genteel South African with wavy blond hair, was deployed to Vietnam’s capital with $2 million and the momentous task of establishing the Seventh-day Adventist Church’s first “urban center of influence” in the southeast Asian country. Bekker, however, struggled to find a suitable property in Hanoi. The asking price for a vacant lot topped $2 million and often approached $3 million to $4 million. Bekker prayed as he made trip after trip to Hanoi from the Singapore-based headquarters of the Adventist Church’s Southeast Asia Union Mission, where he works as special assistant to the president. Then suddenly someone offered a prime plot of land with a new seven-story building for only $1.8 million — and the rest is history. 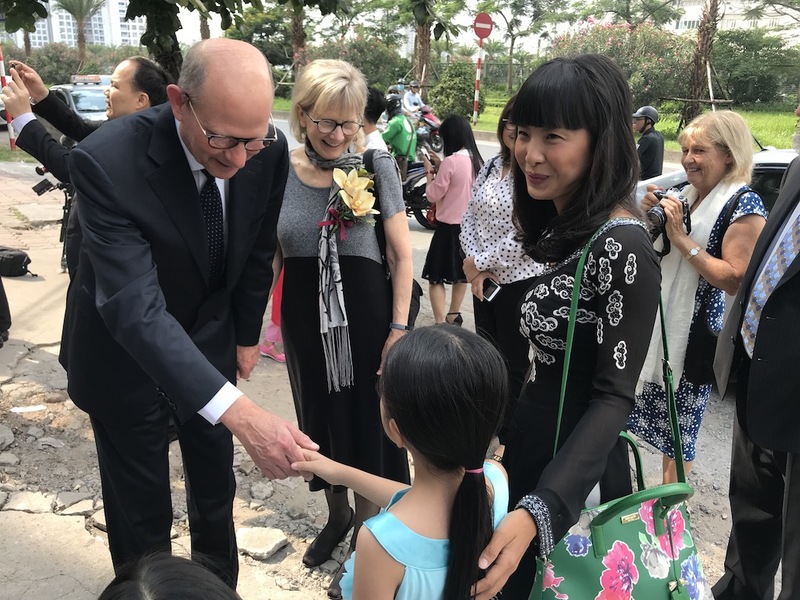 Bekker beamed with joy on May 22, 2018, as Adventist Church president Ted N.C. Wilson and other leaders inaugurated the seven-story building, which will house a bookstore, a health food store, a foreign-language school, a music school, a health center, ADRA’s Vietnam headquarters, and meeting halls for two congregations. Wilson, speaking at the opening ceremony, acknowledged the hard work of Bekker as well as construction adviser Peter Koolik and others in raising up the community center, which is called Forward Venture. The origins of the project go back to 2014 when Wilson visited Hanoi in the north after leading a milestone evangelistic series in Ho Chi Minh City in the south. Wilson was the first non-indigenous person permitted to speak at an Adventist evangelism event in Vietnam since 1975, a major step for the church since the government granted permission for the denomination to resume operating here in 2008. Following the visit, Wilson appealed for a community center to serve the people of Hanoi, and Bekker was assigned to the project. Wilson pledged to help raise the needed funds, with the understanding that he would match the amount contributed by the church’s Southern Asia-Pacific Division and Southeast Asia Union Mission. In the end, the Adventist world church gave $1 million, while the division and union each gave $500,000. But Bekker couldn’t find a plot of land. The properties that he inspected cost too much or were badly located. A potential deal fell through. Then a friend of a friend introduced Bekker to a developer who owned a lot and was constructing a seven-story building on it. The developer wanted only $1.8 million for everything. The moment that Bekker saw the property, he knew it was perfect. Bureaucracy and other snags delayed the purchase from being finalized. Another buyer caught wind of the property and offered a larger amount of money. Bekker kept praying, and the developer ultimately rejected the new offer, saying the Adventist plan sought to benefit the community and not enrich the owners. Those involved in the project can’t explain the purchase. During the inauguration, Adventist leaders toured the community center and prayed on each floor. The church has 15 ordained pastors in Vietnam, and all were invited to the event. Also in attendance were 40 farmers — who rented a bus in southern Vietnam and traveled nonstop 625 miles (1,000 kilometers) in two days to Hanoi — and a few lay leaders like Vo Hiep, 75. “This is a special gift from the Lord,” Vo said of the community center. 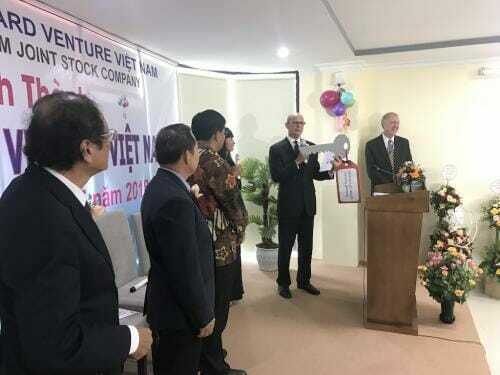 Vo, who has built seven churches in Vietnam with money that he raised from Vietnamese people living abroad, expressed hope that a similar community center would open one day in his hometown, Da Nang City, located 14 hours by train from Hanoi. The Adventist Church has about 12,600 members in Vietnam, a country of 93 million people. After the inauguration, Wilson visited the offices of two senior government officials to thank them for their assistance in opening the community center and for the religious freedom that Vietnam provides to its people. “I want to pledge to you Seventh-day Adventist commitment to helping society,” Wilson told Senator Ngo Sach Thuc, vice president of Vietnam Fatherland Front, which oversees religious organizations in Vietnam. Ngo spoke highly of Adventist initiatives to help others. 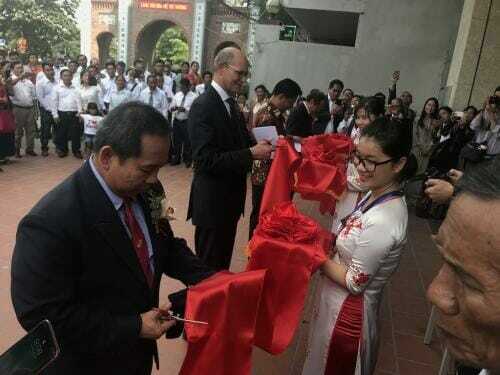 “We appreciate what the Seventh-day Adventist Church is doing to help people in Vietnam,” he said. Two hours later, General Vu Chien Thang, a senator and chairman of the Government Committee for Religious Affairs, welcomed Wilson into his office and congratulated him on the opening of the community center. Wilson shared Bible passages with the two government officials and prayed for them. Accompanying Wilson throughout the day was Tran Thanh Truyen, president of the Vietnam Mission. A wide smile on his face manifested his delight.